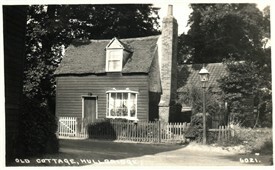 This little cottage on Ferry Road purportedly built 1738 making it the oldest habitation left in Hullbridge. The building has undergone several transformations in the last 120 years. The earliest picture we have from the 1900's shows it as a simple tarred weatherboarded affair with a flat roofed bay window and small projecting porch canopy. 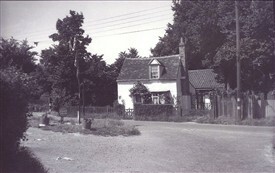 The first postcard picture by Alfred Padgett c1924 shows the cottage basically unchanged. Note the sea-shells on the roof of the bay window. (Is this how the cottage got its name??). There is a detached extention immediately behind, perhaps a separate dwelling. The next picture was taken by Mr A. Cook c1950 shows the cottage now cement rendered like it is today with a nice little arched porch. Around this time the cottage was owned by a William Smith (Recollections by Harry Wright) and rented out to George Gibson a former brickmaker, who made a living on the premises by sharpening knives and repairing all kinds of kitchen and garden equipement. This page was added by David Whiffin on 22/09/2013.